Yeah? Coz it’s an hour to dinner and I have no clue what am feeding the masses. What or who’s feeding you tonight? So what did you feed them? Nothing yet and am running between the kitchen table, stove and refrig like a confused specimen. wow, they should really fear/respect you more considering the power you wield. do they realize your power? i just feed myself by going out to the nearby komala vilas! The problem is I have 2 toddlers who want my attention at the same time as soon as I reach home. There were days when I used to come home at lunch time and do some prep work,these days at work it is crazy busy! !..I need inspiration too..really. I still have some time to think about cooking. Usually make something terribly simple, like spinach dhal, or beans curry with chappathis, which is DH’s dept. 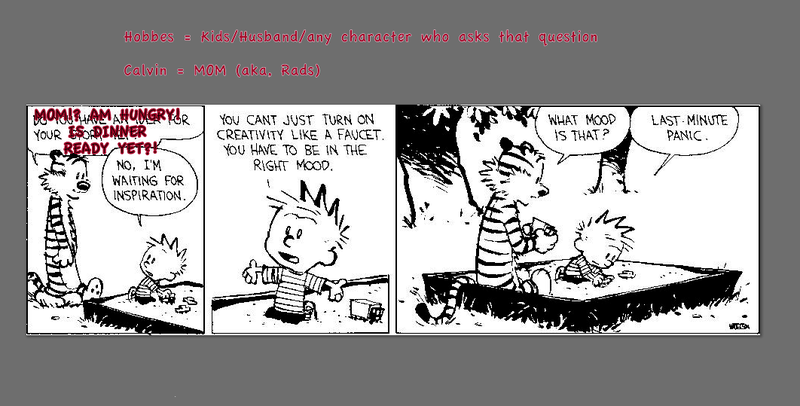 I love hobbes and love Rads too… by the way, what did the creative faucet pan out ultimately. I fed my OH sushi. It came in a box, prepared. That’s my kind of cooking. Uninvoked: I resort to such occasionally too. Especially for the kids! M: I remember those days. Somehow, the challenge’s always been on “what” to cook, than to “cook” itself. If someone laid a menu out for me everyday, I’d be the happiest cook/mom on earth. Upma won’t fly unfortunately. Husband would be very puzzled and wonder if my clock was tuned right or not. Sachita:Unfortunately, it’s the case where one doesn’t realize the extent of one’s power if you constantly in touch or haven’t stepped out. *sigh. So, no, they don’t know. I doubt they ever will too. my husband always gives me complete freedom in “what to cook” , he would say “oh do what ever you feel like” !? – i remember, my mom used to ask each one of us in the family “what do you want for dinner” – we all would say “anything is fine” – and finally , we used to get upma – now, i follow my mom diligently ,don’t think husband is happy though. just going through all your posts! you really should start blogging again.. I feed myself… usually with nothing but since I started falling sick its bread with cheese, bread with chilli sauce, bread with jam, bread with peanut butter.. you get the drift..